CONSULT can display each diagnostic item using the following direct diagnostic modes. ECU identification The ABS actuator and electric unit (control unit) part number is displayed. Self Diagnostic Result The ABS actuator and electric unit (control unit) self diagnostic results are displayed. Data Monitor The ABS actuator and electric unit (control unit) input/output data is displayed in real time. Active Test The ABS actuator and electric unit (control unit) activates outputs to test components. 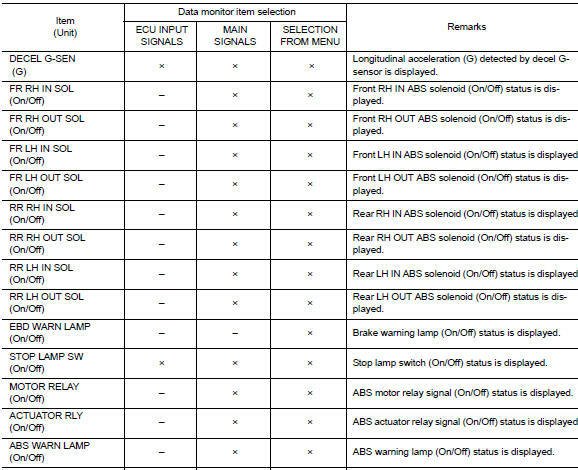 Work support The settings for ABS actuator and electric unit (control unit) functions can be changed. ABS actuator and electric unit (control unit) part number is displayed. Before performing the self-diagnosis, start engine and drive vehicle at 30 km/h (19 MPH) or more for approximately 1 minute. After erasing DTC memory, start engine and drive vehicle at 30 km/h (19 MPH) or more for approximately 1 minute as the final inspection, and make sure that the ABS warning lamp, VDC OFF indicator lamp, SLIP indicator lamp and brake warning lamp turn OFF. If memory cannot be erased, perform applicable diagnosis. When the wheel sensor malfunctions, after inspecting the wheel sensor system, the ABS warning lamp, SLIP indicator lamp and brake warning lamp will not turn OFF even when the system is normal, unless the vehicle is driven at approximately 30 km/h (19 MPH) or more for approximately 1 minute. Brake warning lamp will turn ON in case of parking brake operation (when switch is ON) or of brake fluid level switch operation (when brake fluid is insufficient). VDC OFF switch should not stay in ON position. Refer to BRC-43, "DTC Index". The active test is used to determine and identify details of a malfunction, based on self-diagnosis test results and data obtained in the DATA MONITOR. 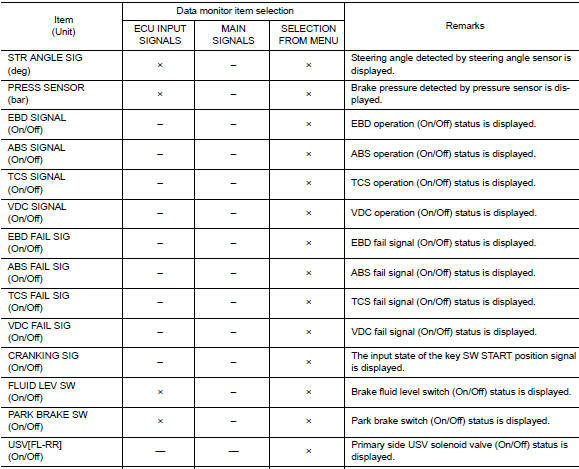 In response to instructions from CONSULT, instead of those from ABS actuator and electric unit (control unit) on the vehicle, a drive signal is sent to the actuator to check its operation. Never perform ACTIVE TEST while driving the vehicle. Always bleed air from brake system before active test. Never perform active test when system is malfunctioning. When active test is performed while depressing the pedal, the pedal depressing stroke may change. This is not a malfunction. вЂњTEST IS STOPPEDвЂќ is displayed approx. 10 seconds after operation start. When performing active test again after вЂњTEST IS STOPPEDвЂќ is displayed, select вЂњBACKвЂќ. 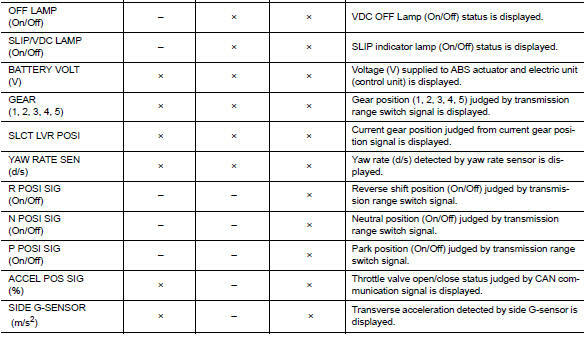 ABS warning lamp, brake warning lamp and VDC warning lamp may turn ON during active test. This is not a malfunction. When вЂњUpвЂќ, вЂњKeepвЂќ or вЂњDownвЂќ is selected on display screen, the following items are displayed when system is normal. *: Immediately after being selected, status is вЂњOnвЂќ. Status changes to вЂњOffвЂќ after approx. 2 seconds. When вЂњUpвЂќ, вЂњACT UPвЂќ or вЂњACT KEEPвЂќ is selected on display screen, the following items are displayed when system is normal. *: Immediately after being selected, status is вЂњOnвЂќ. Status changes to вЂњOffвЂќ after approx. 10 seconds. 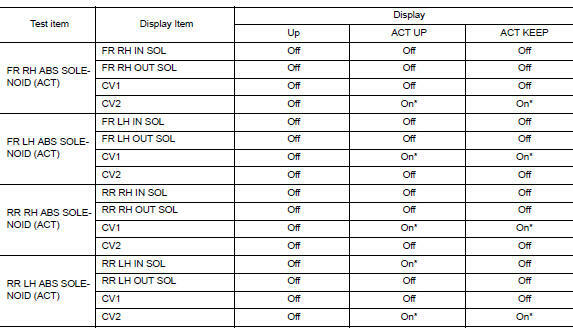 When вЂњOnвЂќ or вЂњOffвЂќ is selected on display screen, the following items are displayed when system is normal. Display occasionally changes On/Off for a moment after ignition switch is turned ON. This is an operation for checking purposes and is not a malfunction. ST ANGLE SENSOR ADJUSTMENT Steering angle sensor neutral position adjustment can be performed. Refer to BRC-54, "Work Procedure".